There are plenty of photos you have probably considered taking on your wedding day. From getting ready, the ceremony to pictures with your family and of course with the groom but what about the ladies that are helping you and have helped throughout the entire wedding planning process? While you know you'll have some time to take group shots of the entire bridal party you'll want to make sure you have these photos with your bridesmaids as you get ready on your big day. The back of a wedding dress is hidden with beautiful details you'll want to capture. You can pose with all of the bridesmaids to show off their dresses as well or have some great close ups of the bridesmaids helping button, zipper or lace up the back of your dress. You have heard about the first look for the bride and groom but what about when the bridal party sees the bride for the first time? 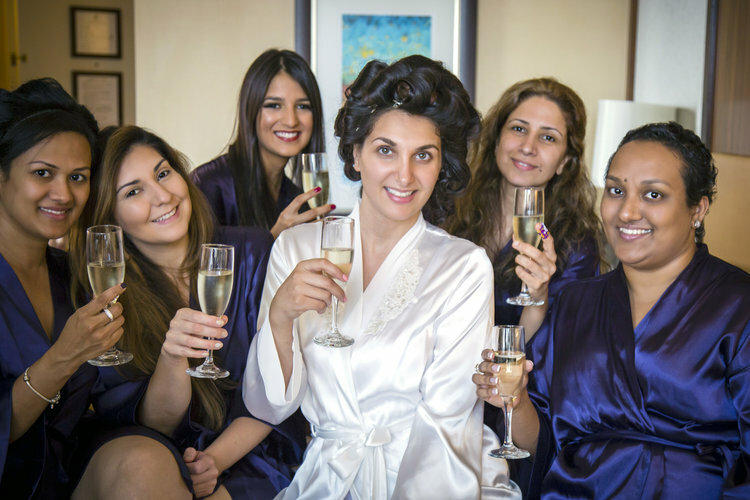 The bride's first reveal to her bridal party can result in some emotional and memorable photo opportunities. As you are getting ready everyone's nerves are a little on edge because everyone wants to look their best. There will be moments when you just need to let loose to relax a little and having a little dance party, jumping on the bed or just being silly are moments that can make for great photo opportunities. Most brides will have getting ready attire for their bridesmaids and you'll want to capture everyone in their cute and thoughtful pre-wedding wear. Bouquets won't last a lifetime but the pictures you have of them will. The bridesmaids and bride bouquet shot is one that you will want to have. There are many ways you can showcase the bouquets as well as the bridesmaid's dresses. From lining everyone up and holding their bouquets out to the camera or hiding their faces to forming a circle around the bride; this is another shot that you can get creative with. You're getting married! There is bound to be a bottle or two of champagne being opened in the bride's honor. Take a minute to pause as you toast away your single life with your bridesmaids for a picture perfect shot. © Debbie Neff Photography, LLC. All rights reserved.